At the Filmfare Awards held over the weekend, Rhea was photographed in a gown by Ohaila Khan. While the actor wears her look well, can’t say we were the biggest fans of the gown itself. You? 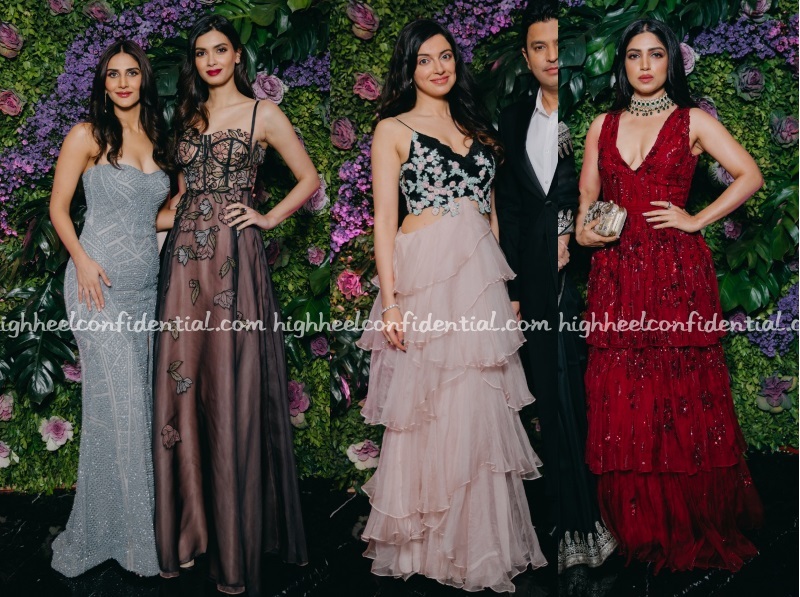 These ladies attended producer Dinesh Vijan and Pramita Tanwar’s wedding reception on Friday evening wearing gowns. While Vaani wore a Falguni and Shane Peacock strapless beaded one, Diana opted for an floral applique one by Sharnita Nandwana. Divya and Bhumi were seen in tiered gowns with the former wearing a Sonaakshi Raaj and the latter in an Ohaila Khan. Did you have a favorite? Even though Diana was an instant favorite more for the finishing touches, it was nice to Vaani do better. Especially after this last appearance. It was an Ohaila Khan gown for Ujjwala while at a recent awards event. Updo in place, she rounded out the look with jewelry from Gemfields. The leggy model wore her look well.